Recipe for an ideal summer afternoon’s concert? How about the Shalin Lu Performance Center in Rockport? 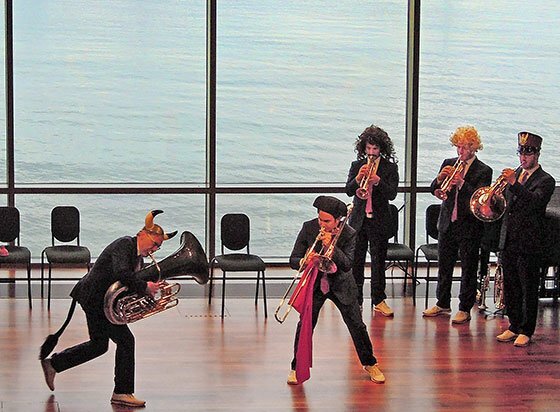 Add a large measure of the Canadian Brass, the view from any seat in that lovely venue, looking out on the harbor, and you’re off to a great start. And the five players, Achilles Liarmakopoulos, trombone; Chuck Daellenbach, tuba; Christopher Coletti, trumpet; Caleb Hudson, trumpet; and Eric Reed, horn; were more than up to the task: they unfurled a beautifully performed, effective amalgam of interesting, enjoyable pieces (many of them not originally written for brass, as they pointed out), devilish humor, and double-tonguing plus much more which demonstrated their virtuosic and musical prowess. Referring to this program as a “mélange” is meant positively, and the players’ ability to perform from various parts of the hall brought freshness, variety and creativity which charmed the audience. As a musician who has had the privilege of conducting many fine brass groups, I found myself appreciating their ability both to play delicious legato, as well as to phrase clearly and musically at every turn. The Bach “Little” G minor fugue warmed the organist’s heart in me, and the rather quick tempo truly worked. Samuel Scheidt’s “Galliard Battaglia,” listed as the first work on the program, actually followed a swinging arrangement of the old hymn “Just a closer walk with thee,” which began whimsically in the back of the hall, a clever move from the group which was not lost on the audience. A Gabrieli Canzona, written for Santo Marco, Venice, showed the group’s more serious side, and several arrangements of Brahms from his organ and piano works (Brahms’ last work, from his organ chorale preludes, and the piano waltzes) led to the final work on the first half of the program, three Fats Waller tunes which were dazzling at the hands and mouths of this accomplished group of players. An observation: the players performed most of the program from memory, and any music used was played from an iPad. Two encores (actually, the players had called the opening, processional piece the “first encore”) were demanded by a cheering, standing ovation: a combination of Handel’s Hallelujah Chorus and “When the Saints Go Marchin’ In,” cleverly mixed; and a mind-blowing arrangement of the “Flight of the Bumblebee” which took our breath away. All in all, a splendid event which couldn’t have been more pleasing, engaging, entertaining, and generous. Hard to imagine a better way to spend a warm but lovely summer late afternoon. Bravi!